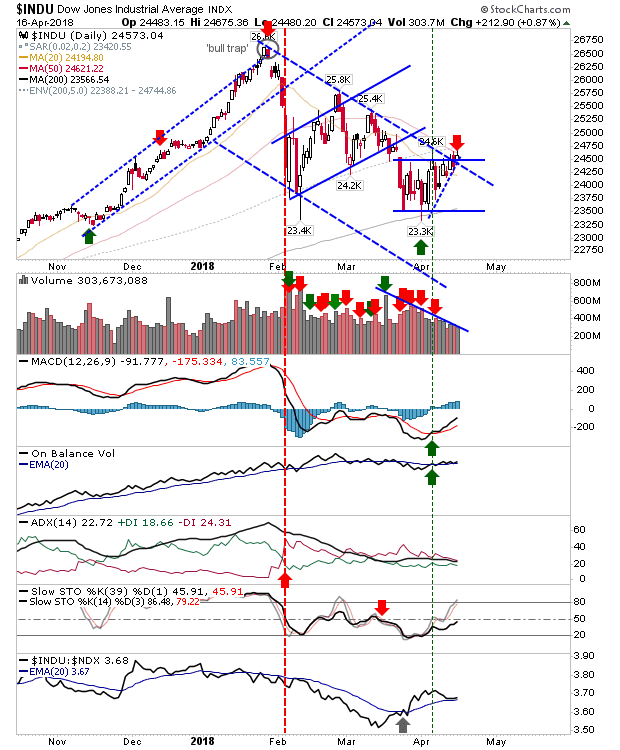 The indices are edging higher but the presence of 50-day MAs and/or channel resistance overhead does offer an opportunity for shorts to take a position. 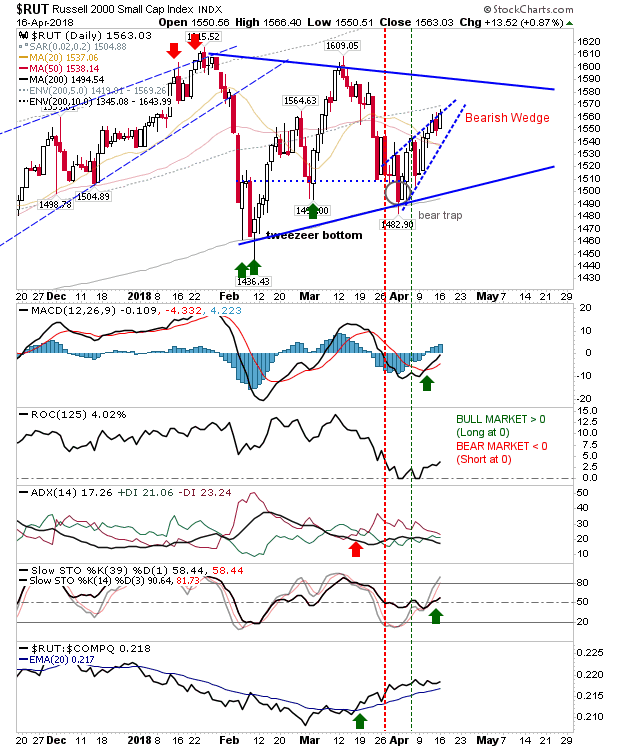 Market action does appear to be favouring bearish wedges with prices moving towards an apex on declining volume. The current apathy will break and how it does will define the direction of the next market phase. 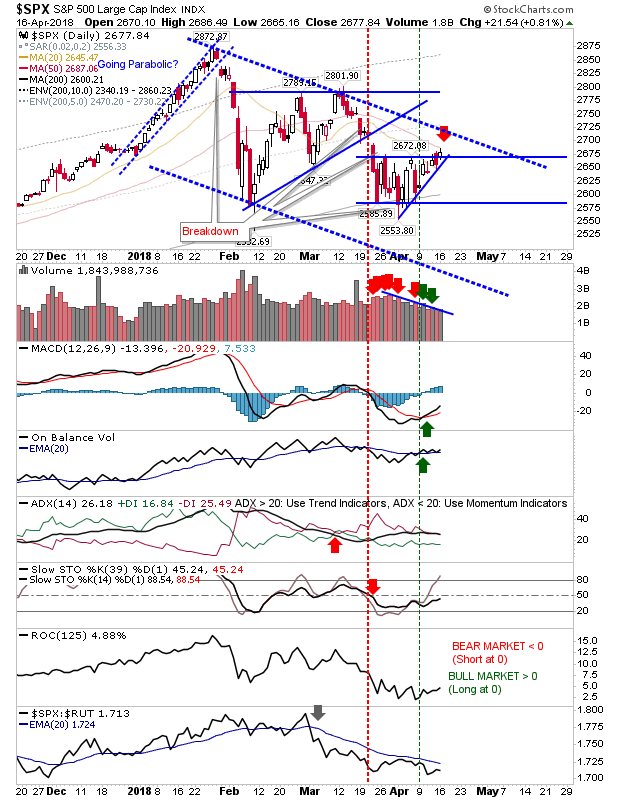 The Nasdaq is also pegged by its 50-day MA and closed with a 2-day 'bearish harami cross'; the risk is measured using a stop above the 2-day high or 50-day MA and play for an initial target of the 200-day MA. The Dow Jones Industrial Average is just above its downward channel but it wasn't able to break above its 50-day MA. Risk is measured on a substantial break of the 50-day MA with a target of the lower channel. Ideally, confirmation would come on an undercut in relative performance (against the Nasdaq 100) but a break of the ascending blue hashed line should be enough of a cue for shorts. The one index which is not presenting a clear trade is the Russell 2000. 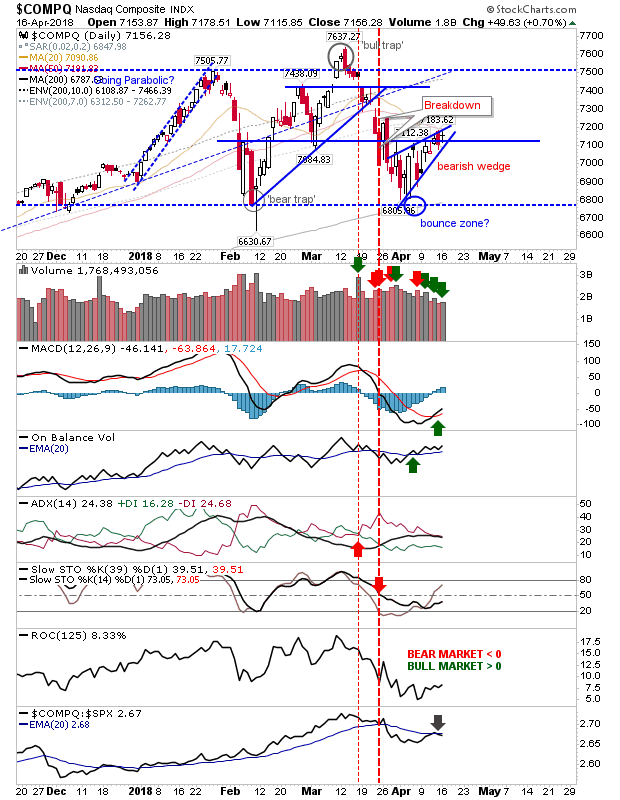 While there also appears to be a 'bearish wedge' forming the index is more heavily influenced by the symmetrical triangle given its push above 20-day and 50-day MAs. Technicals are also more positive, suggesting it may make it as far as triangle resistance before a short play becomes more attractive. Tomorrow will be about tracking indices near their 50-day MAs and channel resistance. A gap higher may offer aggressive shorts an opportunity, but if this strength is sustained beyond the first half-hour of trading it may become more prudent to cover the short. Breaks of rising wedge support would offer a more traditional short entry. There isn't too much for longs to work with although some may use an upside break of 50-day MAs as a cue to buy (stops measure on a return below the 50-day MA).